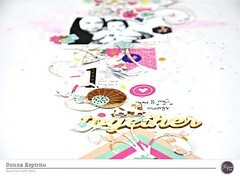 There is a piece of patterned paper in the August Kit, Malibu, from Pink Paislee that has polaroid like frames on it. They just screamed to be cut out, and at first I was going to use them on a page, but I thought they’d be better put to use as a mini album! For the inside pages, I layered four strips that were creased in the middle and then stitched on the crease to form a little book. On the covers, I used two die cut frames from the ephemera/die cut pack and backed them with acetate. Then I added some sequins from the kit on the cover and covered over it with the frame. I did the same thing on the back. The holographic alphas from the kit were perfect for part of my title! For the inside pages, I simply added one photo to each frame and embellished it with bits from the exclusive printables, the die cuts, stickers, and chipboard. I also used some washi tape from my stash to cover up any white areas. After my layering was done, I stitched on each frame and glued them into the album. The pages are simple, but the stitching adds a little interest and the colors just burst! Categories: Field Notes | Tags: August 2017 kit, Malibu, mini album, pink paislee, Process Video | Permalink. Nathalie here with a new project featuring this month’s super gorgeous Aquarelle main kit. Seriously, this kit is so versatile, full of color, and watercolor designs that are perfect for documenting all your cherished memories. I love butterflies, and the “Mariposa” paper included in the kit was the starting point for this layout. However, I went ahead and search the Clique Kits digital store for a butterfly cut file, and found this one from January 2016. The combination of color and clean lines of the butterflies in this project bring the page to life. For this page, I chose to create a watercolor background using a few Prima watercolor palettes. The color splatters can easily be created by sprinkling some water drops, followed by some ink splatters (on top of the water ones), and then using a round brush connecting the color and water droplets together. Though I created the background with a different design in mind, the change of orientation of the background helps the overall look of the page. The cut out butterflies were backed with vellum, and randomly stitched to the watercolor background. All the fussy cut butterflies from the “Mariposa” paper included in the Aquarelle kit were sprinkled around the page, and also sewn into the layout. The exclusive cards that are included in this month’s kit serves as the layer behind the picture. In addition to finding the cut files, I also found some exclusive printables in the store (September 2015 kit) that also match the colors of the Aquarelle kit. The large tab from this printable serves as part of one of the clusters created around the picture. The rest of the embellishments come from the die cut pack, and this month’s exclusive printables. Can you tell, i love butterflies? Trust me, I think i used at least one of them in almost all my projects this month (there are still a few more projects coming to the blog soon!). But you will also be reaching for your detailing scissors to fussy cut this lovely designs. The Aquarelle kit is just a dream to work with. If you haven’t checked the kit, run to the Clique Store to pick one of the few left (i hope they haven’t sold out yet!). You can always leave me a comment if you have any questions on how this page came together. Categories: Art Studio, Locker Room, Uncategorized, Yearbook | Tags: aquarelle main kit, CK Exclusives, Clique Digital store, cut file, Design team project, inspiration, mixed media background, Nathalie DeSousa, Process Video, watercolor | Permalink. Nathalie here bringing you a few entries of my personal journal created using the beautiful ( it is truly a gorgeous!) Aquarelle main kit. This month’s kit features Cocoa Vanilla’s “Wild at Heart” collection which is full of florals, watercolor motives, and lots of beautiful designs. If you haven’t checked the Aquarelle kit, yet, then you better run to the Clique Store to pick the few available for sale. The picture (of the day) was enlarged to fit into one of the pages of the TN (4.25×8.25 in). After gluing it to the page, I added a few pieces (Pinksfresh Studio Alphas, and CK printables) of the Aquarelle kit to the picture. Since the picture has plenty of white space at the bottom, it was the perfect spot to add a few lines about the day’s experience. To balance the page, the large sentiment card in the September 2015 exclusive printables was machine sewn to a piece of white copy paper -cut to the TN’s page size- . This spread was so easy to create. First, I found the center point of the TN page, and used it to cut a large triangle (that will cover the other page of the TN) out of the patterned paper. The title for this spread was created on the paper covered page using a combination of stamps (Pinkfresh Studio’s Nico alpha, and Simple Stories Faith roller stamp), and the Pinkfresh Studio alphas included in the kit. Both pages were created in a really small amount of time (between 10-15 minutes), and I love the different looks, I was able to achieve with the Aquarelle kit, and the CK printables. Remember to visit the Clique Store to check all the exclusive printables, cut files, and most materials used in this pages. You can use the DT codes to receive a discount at checkout. As always, I am a comment away if you have any questions on how this came together. Categories: Field Notes | Tags: CK Aquarelle Kit, Cocoa Vanilla Studio, inspiration, Large picture, Nathalie DeSousa, Process Video, Stamp, Travelers Notebook, Wild at Heart collection | Permalink. Aloha!! It’s Hannah here with you today. The fresh and bold colors in the “Jelly Bean” April Kit have me thinking about Spring. Where I live it’s still pretty green and damp. It has me dreaming about my flower bed from the summer and all the beautiful colors they wore proudly. I knew this kit and the exclusive flower cut file would fit perfectly together to make an awesome layout. Maybe by making a layout about my flowers will entice them to grow faster! If only scrapbooking brought on the season change and made the weather behave?!! While I dream about wearing old sneakers and dirty garden gloves, lets take a look at what I created. I really wanted to go BOLD so I used my silhouette to cut the exclusive floral cut file with pattern paper. The cut file is really intricate so it really helps this busy paper pop. The flowers come alive. It will work well on my layout because I am using white cardstock that I made several stripes with dark grey acrylic paint. The color against the dark and white really help them stand out. I cut one set of flowers big and left them open. I also cut a couple of other sets in plain white cardstock. I like to use smooth cardstock with my cut files. I find they look better and the thicker quality helps them hold up better in the silhouette. These smaller sets I backed with some of my left over “Paint Me” patterned paper and some of the dotted vellum. I used some tiny staples in gold from my tiny attacher to attach and hold the paper together. I wanted to create shadows by attaching them this way. I wanted the cut file to lift up a bit from the paper to add dimension too. To me this really helps makes an impact on a layout when you use dimension and shadows in your favor. The bright colors in this kit and paper really help with that as well. I used 3 3×4 size photos that I matted with white cardstock. With all the color in the cut file and in my photos I didn’t want to go crazy. I also knew I would finish off the layout with some splatters of the Shimmerz Acri-tonez Paints. I added a couple of the cut aparts from the “Daily Details” Paper for some extra layers. I love the writing on them it’s so fun and said perfectly how I felt. The gold foil on some of the cards is gorgeous and I couldn’t help myself not to use that on this layout. I lightly embellished this page. The color and intricacy of the cut file really helped fill the page up. I used a few of the Freckled Fawn foam word phrase stickers. They are really fun. I also added some of the Bella Blvd Puffy Stickers and Epoxy Stickers from the Clique Store. These stickers add just the right amount of extra color to tie my layout together. For the title I used the Elle Studio White Alphas and one of the Heidi Swapp Acetate words in gold. I love when I have word phrases in my kits to help me with my title. I don’t really mind if I don’t have the most thought out title. As long as it helps capture the feelings I have when I see my photo that’s all that matters to me. I know I will have journaling somewhere on my layout eventually so my family and I can remember all my thoughts about these photos. Though truth be told, I just really enjoy taking photos of my gorgeous flowers. They are all mine and they are beautiful! I just want to remember how beautiful they are, especially during the middle of the winter when it has been raining for ten days straight and you can see your breathe when you wake up in the morning. It’s times like this I want to remember there is color and beauty that grows right in my own back yard. I don’t need a fancy title this time for that! To finish off my layout I added Freckled Fawn enamel dots and shapes around my cut file. That is intact what I want my eye to go to first when I look at this layout. I added the year for a date with more of the White Alphas by Elles Studio. Since the date really isn’t important I don’t need it to stand out. I also finished by adding splatters with the Shimmerz Acri-tonez Paints. I just let the paint fall out of the bottle as I lightly squeezed it. I really love the look it gave adding them this way. The paint made really raised spots around my layout and have great dimension. I made sure I put my layout off to the side while it dried so the paint didn’t get touched, or settle down. I hope you are inspired today to create different looks using just one cut file. It really makes a cut file be versatile when you can get different looks just by changing a few things, like color, shape and what is behind the cut file itself. Have a great day and I hope you are excited about playing with your April “Jelly Bean” Kit when it shows up at your door. When it does arrive be sure to tag us and share what you creating with your kit!! Also Check Out my Process Video on the Clique Kits Youtube Channel for more details on how I made this fun layout. Categories: Geek Lab | Tags: April "Jelly Bean" Kit, april 2017, Bella Blvd, Bright Colors, Clique Kits Youtube Channel, cutfiles, flowers, freckled fawn, geek lab, Hannah Lemieux, Heidi Swapp, Mixed Media Scrapbooking, Process Video, Shimmerz Paints, silhouette cameo | Permalink. What do you do when you have a piece of patterned paper and you love BOTH sides of it? Well all I did was fold a corner over and was able to create an interesting design AND see both prints at the same time! For my embellishments, I also stuck with the same color palette and used some of the 3×4 cut aparts, the die cuts, and even pieces of this month’s exclusive printable. And the gold foiled elements add the perfect sheen to the page, too! Hope you are enjoying working with your kits! Categories: Study Hall | Tags: april 2017, Bella Blvd, CKApril, CKExclusives, die cut, Process Video | Permalink.